Some people say that K75s have no "soul"
K100-forum.com » General discussion » Some people say that K75s have no "soul"
I'm with you, I've ridden a few different Bricks. But I prefer my 75s and would never swap her. A mate of mine decided to upgrade to a K1200RS which I did put a few miles on. While he said he preferred the 1200 on the highway he admitted regretting selling the 75. I agree. My K75S feels like it weighs half as much as the RT and the 16V K100RS. The K75 engine is sweet in how it effortlessly puts massive amounts of pavement behind me. Just did a trip (1500 to 2000 miles) on my 75s. In the past it has been the day or overnight ride and I have loved riding it. Now after spending 5 nights out on the bike with some cool temperatures and rain I think it will be getting more touring duty. It just runs in and out of corners so much smoother than my 100s. I have not rode any 1100, 1200, or 1300 enough to feel comfortable (but have been tempted) to take on a trip. I think the 75 has the right power and weight to just make all day two lane riding a pure joy. I'll join in too. I spent an entire Summer riding my K75C, stock 'screen, tankbag & panniers, camping and rolling round the western US on mainly two lane roads. I've always missed it since we parted and another will surely find its way to me in the future. Yesterday I stopped at the local BMW shop and a customer had just bought, from a private seller, a low seat, '95 K75 non-ABS with factory touring screen, with barely 17,000 miles on the clock. He was having a once over and fluid change done. He told me he paid $3000 for it. Bought it from a helicopter mechanic. It was near pristine. My heart sank. I've only had mine since December, but saying it has soul sounds about right. So versatile. A two-mile trip to the store or a day riding around; alone or with one of the kids on the back, it still seems just right. My first ride on a BMW was on a K75 my old boss brought new and still owns, he told me to take it to Queensland about 2000klm return trip. I wanted one from that time, a few years later he told me to take holidays and his bike to Philip Island GP. Great bike and great memories. If I had a little bit of room I would buy Smithy's and paint it black. Personally I can't wait to get hold of a K75. 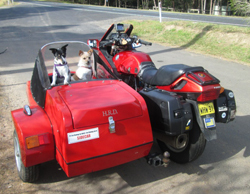 @Waz wrote: My first ride on a BMW was on a K75 my old boss brought new and still owns, he told me to take it to Queensland about 2000klm return trip. I wanted one from that time, a few years later he told me to take holidays and his bike to Philip Island GP. Great bike and great memories. If I had a little bit of room I would buy Smithy's and paint it black. Well you cant buy Smithy's because I did, but will be selling my K75RT soon. I'll put it on the forum when I'm ready. But yes I agree the K75s are a good thing. Noticeably lighter than the K100 or 1100. @Rockman wrote: Noticeably lighter than the K100 or 1100. Even my K75 Frankenbrick, which ended up being essentially a K1100RS with a K75 motor feels noticeably lighter when riding. I like Charlie's saying better- The cheapest thing on a BMW motorcycle is the rider. Another I heard and reckon is just about right (except for you Rick G) is Most BMW car owners don't realise BMW make motorcycles. I've never said no soul. I've done a few 1000kms on a K75. I'd still prefer my K100. People rave about the revvy smooth K75 I know; problem is that I've never enjoyed any bike where I have to rev it hard to make it go, I've always prefered a bike that has enough mumbo to just accelerate in top gear when I have to overtake and the K100 has that capability In that sense I've always found the K75 to be gutless. Personally I wouldn't have one except for a K75C G/S conversion. My wife wants another K75 eventually but it has to be an ABS model K75s and there aren't that many in OZ. I wont ride it, just like I don't ride her R1150R if I can help it I really enjoyed the R1100R we had previously, the 1150 I just find a very uncomfortable bike. If someone had a nice K75s ABS and was attracted by the idea of a very low km 2008 F650GS (800 twin) we could talk. Not joking either. Al you can't ride a 75 like you ride a 100, or you will find it as you described it. Although the engines share the same DNA they react differently. A 75 needs to rev and if you do, you will be rewarded. @MartinW wrote: Al you can't ride a 75 like you ride a 100, or you will find it as you described it. Although the engines share the same DNA they react differently. A 75 needs to rev and if you do, you will be rewarded. I'll say it again. I've never enjoyed any bike that needs to be revved hard to make it work. Not just a K75; any bike. A K75 is so smooth that it isn't really revving it hard as much as it is revving it high. From my experience the engine seems to love running at high RPMs. Very similar to redlining the RX-7 rotaries that I've owned. Once I got used to the way the K75 revs after a couple of 5000+ mile trips, I now find myself riding around in 4th and mostly use 5th as an overdrive on the interstate. Now I want to rid myself of this milquetoast ride and get myself a vintage Valkyrie. I'm concerned about all the polishing though. What to do; what to do? @Laitch wrote: Now I want to rid myself of this milquetoast ride and get myself a vintage Valkyrie. I'm concerned about all the polishing though. What to do; what to do? Just get a blacked out Valkyrie. Those are all the rage these days. @duck wrote: A K75 is so smooth that it isn't really revving it hard as much as it is revving it high. From my experience the engine seems to love running at high RPMs. Very similar to redlining the RX-7 rotaries that I've owned. You enjoy it. Thats all that matters. Me, I still think they are gutless. Give me my k75rt, rain, hail, 15cm deep mud roads,45° heat, below 0° cold. I never feel like I’m reving it hard. Enough power to pass and climb but with smooth delivery. Yet it’s happy to sit on the speed limit with comfort and ease. Never had a road bike that was such a good all rounder and if for some strange reason I was only allowed to have one bike I think this would be the one. Is that what they say? Sounds more like something an internet troll would say to brew up trouble. Trying to pull a sidecar with a K75 would seem like a woftam to me, so I'll stick with my K100 for that job. Trying to compare a triple with a four would seem a little spurious. One man's smooth is another man's soul-less. One man's unpleasant vibration is another man's kinesthetic thrill. Not trying to stir up anybody. I didn't realize we were talking about pulling a chair, in that case I understand your preference to a 100 over a 75. Lol sorry Caveman, I was really referring to the original post, not your reply. ...and I was just talking about a chair in regards to my own K bike. I just, only yesterday, got my '95 R100 Mystic plated and road legal. 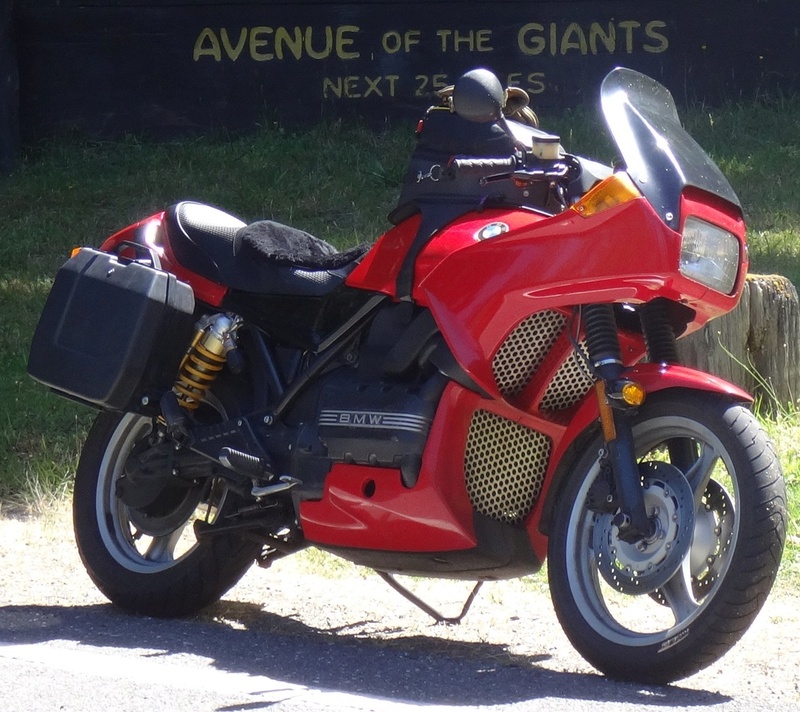 It's a different animal entirely, at 60hp, to my 173hp K13GT, but it gets me down the highway smoothly, with a long-legged torquey feel, plush and tight handling at the same time. Oh, and the four piston dual Brembos over 305mm discs stop much like a more modern bike. Vive la difference!